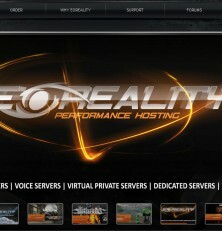 End of Reality provides an unmatched level of performance by hosting our services on the best server hardware in the industry. We use super-fast 15,000rpm Hard Drives in a RAID-10 configuration in all our host machines ensuring both speed and redundancy. End of Reality also utilizes the latest processors from Intel with up to 16 cores in each host machine and dual-gigabit NICs. Combined with a Network and Power 100% uptime SLA and dual A+B power feeds, EOR is unparalleled in uptime and performance.